In first pAsuram, AzhwAr requests emperumAn “while you are capable of protecting all, and are the controller of all, these samsAris (bound souls) are going through great sufferings – I am unable to bear the sight of this; either you remove their suffering or finish me so that I don’t have to think about it”. In first pAsuram, AzhwAr says “I am unable to witness the sufferings of the samsAris; this being the case, you who engages in difficult tasks for your devotees to fulfil their desires, should make me leave my body so that I don’t have to witness this suffering [of samsAris]”. First pAsuram. AzhwAr says “You should mercifully facilitate shedding of my body to reach your divine feet, from the midst of these [samsAris] who have their gain/pain outside you”. kaNNALA! kadal kadaindhAy! un kazhaRkE varum parisu? enna – how [strange] are they? kadal kadaindhAy – oh one who has the helping tendency of churning the ocean (even when requested by those with ulterior motives)! paNi kaNdAy – you have to mercifully speak a word (as in the case of SrI bhagavath gIthA 18.66 “mOkshayishyAmi” (I will free you)). How strange are these worldly aspects which cause innumerable sufferings and which make those who do not stay by one’s side, due to enmity, to smile and make those relatives who stay by one’s side, out of friendship, to feel weakened and to worry for one’s suffering? Oh merciful one who has the helping tendency to churn the ocean! You have to mercifully speak a word (as in the case of SrI bhagavath gIthA 18.66 “mOkshayishyAmi” (I will free you)), without delaying any further, to let me die for the sake of the attainment of the divine feet of you who are apt [lord]. It is implied that, the body is also part of “sarvapApa” (all sins) which is explained in the gIthA charama SlOkam. naNNAdhAr muRuvalippa – How sad that some see the suffering of others and feel joyful! SrI bhagavath gIthA 5.29 “suhrudham sarvabhUthAnAm” (being the friend of all creatures) – arjuna asked “when will my likes/dislikes disappear?” and krishNa said “If you realize that I am well-wisher of all, you too will start seeking good for my wealth”. naNNAdhAr indicates enemies. When some one goes through suffering, even if they [enemies of the sufferer] had never consumed betel leaves and nuts (which are considered as an enjoyable food item), they would seek out for such enjoyments on that day [of others’ suffering]; they would buy new clothes and wear them; they would laugh out loud. nal uRRAr – While one should consider sarvESvaran as the natural relative and should remain inseparable from those who are fully surrendered to emperumAn as said in mudhal thiruvanthAdhi 55 “avan thamar evvinaiyarAgilum en kOn avan thamarE” (Whatever may be the conduct of emperumAn’s devotees, they are my rulers), instead considering the bodily relatives as natural relatives, these people would feel very bad when something bad occurs to them as said in thiruvAimozhi 9.6.2 “ninaithoRum sollum thoRum nenjidindhugum” (my thoughts, words and mind will tremble) – that is, whatever AzhwAr goes through in bhagavath vishayam (emperumAn related matters), they will go through that in worldly matters. [While enmity is bad, is feeling bad for other sufferings bad?] As said in SrIvishNu purANam 1.19.31 “sarva bhuthAthmakE” (kESava who has all AthmAs as his body, has no enmity/friendship with anyone). What is said in “karaindhEnga, muRuvalippa”, is reflected in the same SlOkam “mithrAmithrakadhakutha:” (who is friend and who is enemy?). Since all of these are based on [worldly] rAga dhvEsham (likes, dislikes), there is no difference between friendship and enmity. As said in SrI bhagavath gIthA 15.5 “dhvanthvair vimukthAs sukhadhu:kha samgyai:” (those who are free from joy and sorrow), the joy and sorrow are for namesake only. In the material realm, both are sorrow only in reality, which is what is explained here. In SrI ayOdhyA, though there is scope for enmity, they all prayed to SrI rAma in the same manner as said in SrI rAmAyaNam yudhdha kANdam 131.95 “rAmamEva” (as they were only thinking about SrI rAma, they did not harm each other); what is the reason for that? Though at times inimical feelings may arise in their minds , they would think “that will hurt SrI rAma’s feelings” and such inimical feelings will not lead to actions. In bhagavath vishayam, one will be as said in SrIguNarathna kOSam “pushpAnkAragaissamam” [not just in this world, even in paramapadham, devotees will remain like garland etc]. When sarvESvaran engages with periya pirAttiyAr, other consorts will become part of the enjoyable aspects such as garland, sandalwood paste etc; and when emperumAn engages with those other consorts, it will be like his engaging with periya pirAtti’s bosom, waist etc [they are all like her limbs]. As said in mudhal thiruvanthAdhi 42 “thirumagaLum maNmagaLum AymagaLum sErndhAl thirumagatkE thIrndhavARen kol” (When all his three primary divine consorts are present, he would be fully attached to SrI mahAlakshmi) – he will be fully focussed on SrI mahAlakshmi only [others will not consider themselves to be equal consorts and will be subservient to the divine couple]; this is because, the joy of such togetherness is witnessed in SrI mahAlakshmi’s face. As said in SrI rAmAyaNam ayOdhyA kANdam 12.68 “yathAyathAhi kausalyA” (kausalyA conducted herself along with the other wives, for the pleasure of dhaSaratha), if such conduct can be seen in material realm, where someone like kausalyA who had some basic good qualities conducted herself in a superior manner over the other wives with dhaSaratha chakravarthi, what to speak of SrI mahAlakshmi in spiritual realm. yathA yathAhi – kausalyA presented herself to dhaSartha according to each season, without any specific identity for herself [fully dedicated to her husband]. eNNArAth thuyarviLaikkum – For AzhwAr, both the reaction of feeling pained or joyful appears as suffering only. Even if one can find the boundary of the joy of paramapadham, one cannot find the boundary of the suffering in this realm. Just as there is pure bliss in the spiritual realm, there is infinite suffering in this material realm. [The commentator becomes emotional thinking about emperumAn‘s suffering in this realm] SrI rAmAyaNam AraNya kANdam 67.24 “rAjyAth bramSa: …” (My sufferings such as leaving behind my kingdom, forest dwelling with sIthA, losing her, seeing jatAyu mahArAja die etc, will even burn down fire). emperumAn himself suffered in this material realm, when he gave a helping hand to the suffering souls of this material realm. When he was set to be crowned on the throne, someone else said that they need the throne. Even if he was not crowned, at least he could have lived in the palace in the capital city. SrI kausalyA said “let my son not rule the kingdom, but even if he has to beg, let him do it in my sight” [but that also did not happen]. “sIthA nashtA” – emperumAn thought that he can enjoy some private moments in the forest, but alas, they were separated from each other and lived in different locations. periya udaiyAra (jatAyu mahArAja) [who was a father-figure for SrI rAma] who came to the rescue of pirAtti, also lost his life. Why is it that what was glorified previously as “rAjyanASObakarshathi” and “vanavAsO mahOdhaya:“, is now explained as suffering? Originally, he left for the forest looking to mingle with his devotees and to help the sages – but since there were hurdles for those expected joys, now they feel like sorrows. As he ended up separating from pirAtti and losing jatAyu mahArAja, the loss of the kingdom and the forest-dwelling (which felt joyful before) are appearing to be sufferings. By these two, all the sufferings of this world are contemplated. 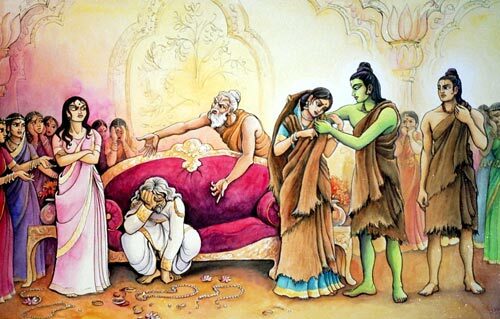 “nirdha hEdhapipAvakam” – It [samsAram] is so powerful that it even separated the inseparable lakshmaNa from him. empeumAn’s replies “What shall I do? All of these are based on the effect of their actions. They are not caused by me”; and AzhwAr speaks further. kaNNALA – If they simply have to reap the results of their actions, what is the use of your compassion? Compassionate person is generally explained as “kaNNudaiyavan” (one with eyes). Alternatively – kaN also means place, implying the vast world. AzhwAr is asking “Is this an independent place? While you are the controller of everyone in this world, why are they engaging in activities that are contrary to their nature?”. kaN also implies controller. emperumAn asks “where did you see me help anyone so that he doesn’t have to reap the results of his karma (actions)?”. AzhwAr says “there is plenty of such incidents” and gives an example. kadal kadaindhAy – Didn’t you take up great task to even help the prayOjanAntharaparar (those with ulterior motives – here, dhEvas), to be freed from the sufferings caused by the curse of dhurvAsa? emperumAn says “They (dhEvas) had the desire to approach me; for those who don’t have the desire, what can I do?”. AzhwAr says “In that case, you have to ensure that I reach your divine feet, so that I am not in the midst of these samsAris”. una kazhaRkE varum parisu – The state of being at your divine feet which are apt and enjoyable, instead of going behind distractions [such as aiSvaryam (worldly pleasures), kaivalyam (self-enjoyment) etc]. As AzhwAr had a little bit of desire, ISvara agreed to fulfil his desire. thaNNAvAdhu – Without delay. I cannot be satisfied by you saying “I will do”, you have to do now. emperumAn asks “Why should I do it immediately?”. adiyEnai – Due to my self-realised state, I cannot co-exist along with samsAris. paNi kaNdAy sAmARE – paNikkai – speaking/saying. Word is related to thought. For you it is a simple word, but for me, it is my sustenance. sAmARE paNi – You should ensure that I am freed from my body; emperumAn asks “Why are you just praying to be freed from your body like a kEvalar [one who is focussed on kaivalyam]?”. That is because, AzhwAr‘s desire is to first be freed from being in the midst of samsAris, as said in Saunaka samhithA “varamhuthavahajvAlA pancharAntharvyavasthithi: | naSaurichinthAvimukha jana samvAsavaiSasam ||” (It is better to be in the midst of a forest fire than to be present in the midst of those who are not interested in meditating upon krishNa). For one who is caught in a forest fire, he will first seek out for water and shade, then only will he look for enjoyable aspects; similarly, AzhwAr too requests to be first freed from his body to avoid being present amidst samsAris. This entry was posted in thiruvAimozhi, thiruvAimozhi 4th centum on April 11, 2017 by Sarathy Thothathri.